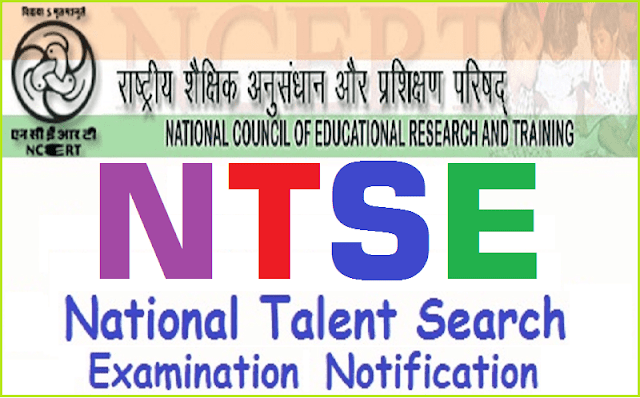 NCERT NTSE National Talent Search Examination 2019 Stage II National Level Notification/ NCERT NTSE Scholarship Exam 2019, NTSE #Scholarships Exam - #NTSE SAT, MAT Exam 2019: Stage I State Level NTSE Exam date and Stage II National Level NTSE Exam date- National Talent Search Examination 2019 notification has been given by the National Council of Educational Research and Training. The National Talent Search Examination for students studying in Class X is meant to identify and nurture talent. The examination is conducted every year at two levels:- Stage-I (State Level) and Stage-II (National Level). a) Scholarship of Rs.1250/- per month for Class-XI to XII. b) Scholarship of Rs.2000/- per month for Undergraduates and Post-graduates. c) Amount of Scholarship for Ph.D. be fixed in accordance with the UGC norms. c) 3% for Physically Challenged Group of Students. All students of Class X studying in recognized schools are eligible to appear for the Stage -I examination, conducted by the States/UTs, in which the schools are located. There will be no domicile restriction. Students registered under Open Distance Learning (ODL) will also be eligible for scholarship, provided the student is below the age of 18 years (as on 1st July of the particular year), the student is not employed and s/he is appearing in class X examination for the first time. Stage II National Level NTSE Exam: those who qualify Stage- I, will be eligible to appear for Stage-II examination, conducted by NCERT. c) Scholastic Aptitude Test (SAT). At Stage-II (National Level), there will be negative marking in each paper. For each wrong answer 1/3 marks will be deducted. No marks will be deducted for un-attempted questions. Qualifying marks for candidates from General category is 40% in each paper and for candidates from SC, ST, PH is 35% in each paper. Language Test Qualifying in nature and marks obtained for Language Test will not be counted for final merit. Candidates may contact the State/UT Liaison officer for procuring application form. The completed application form should be signed by the Principal of the school much before the last date of submission. The candidate as well as the Principal of the school must adhere to the last date for submission of the Application Form. Different states may have different last dates for submission. Please confirm from the liaison officer of your state, the address at which the completed forms are to be submitted. The State wise contact of the liaison officers are given below and are also available in the NCERT website www.ncert.nic.in. All queries related to application form should be directed to the State Liaison Officers (LOs). No application should be sent to NCERT. States and Union Territories may notify the fee required which will be paid for the Stage-I examination. Therefore, before submitting the application form, you may find out the fees charged for Stage-I Examination and also the mode of payment from the respective State.Liaison Officers (LOs). However, NCERT does not charge any fee for Stage-II examination. Indian Students Studying Abroad in Class X can appear directly for Stage II NTS Examination under conditions prescribed in the NTS brochure which is available on the NCERT website. Candidates may fill up the Application Form, available on the NCERT website and send to the undersigned along with a photocopy of the mark sheet of previous examination, latest by February 28th, 2018. Application Form for students study abroad will be uploaded on NCERT website in the month of October, 2018. Announcement for Indian Students Studying Abroad will be announced separately. Note: NCERT has not authorized or approved tests conducted by any other agencies for issue of certificates or award of scholarships and bears no responsibility whatsoever for them. 1. There will be not any paper on Language Test. 3. Admit Cards will be auto-generated. Successful/Recommended candidates of Stage- I Examination will be informed separately about the process of downloading the admit cards. UTs of the country) Paper- I Mental Ability Test ( MAT) 0930 to 1130 hrs (All candidates except Visually Challenged Candidates) 100 100 120 Minutes 32% for SC, ST and PWD and 40% for General Category in both papers. - No Negative Marking in both the papers. - Only candidates qualifying in both the papers separately will be considered for merit. -Selection of the awardee will be made on the basis of total Marks scored in MAT & SAT based on merit.